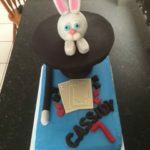 Where else can you see Baker Magic Shows – In your home!! I had a great time at Cassidy’s 7th Birthday party!! Look at the very creative cake that Cassidy’s mom made for the celebration. Where Can You See Baker Magic Shows in July!! JULY 1 MAGIC is back at Downey’s Farm in BRAMPTON for a show at 1pm and then in CREEMORE, Ontario to help celebrate Canada’s 149th birthday at 8:30pm, just before the fireworks start!! Two Easter Weekends of Magic!! Join Us for Easterfest! Two weekends!! “Abracadabra” Magic with Steve “The Great Steverino” Baker at 11:30 a.m., 1:30 p.m., 3:30 p.m. each day! March Break Magic(4 different days)! On Sunday, March 13th, Baker Magic Shows is pleased to be part of the City of Brampton‘s “Bunny Eggcitement Free Community Event at the South Fletcher Sportplex at 500 Ray Lawson Blvd. February 15th is Family Day!! The Great Steverino is excited to be performing at the Alliston Boston Pizza on Monday, February 15th. Balloon animals from 12:30 PM until SHOW TIME AT 1 PM! !